In today’s world, a skull is not a good sign. “DANGER! HIGH VOLTAGE!” is just one of the many examples, and perhaps the most famous one. We are teaching our kids not to touch things where a skull is being placed, like dangerous chemicals and electricity, and they often see in their cartoons poison bottles with a skull. But, while all of these messages are perfectly sane and welcome, in order to keep our children alive and well – and not only children, but some potential Darwin award winners, as well – at the same time, the skull symbol is getting a bad reputation: skull = bad. 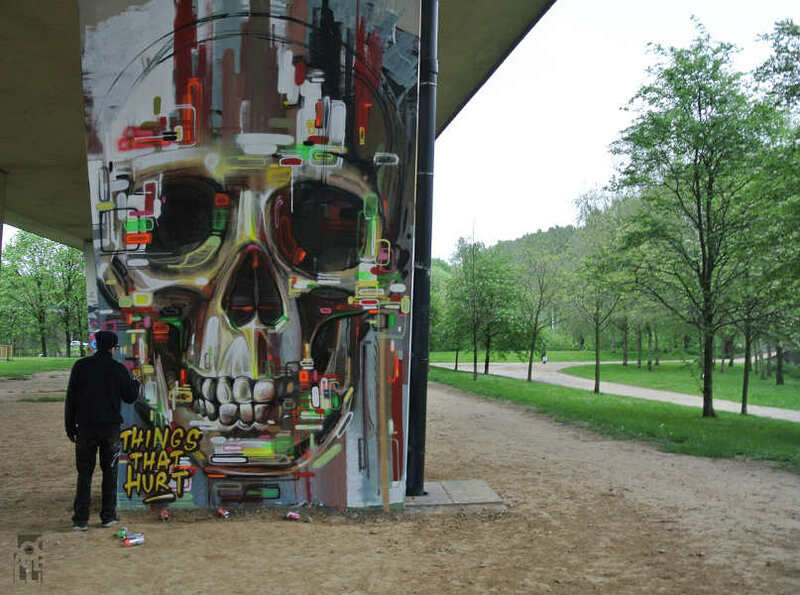 And Steve Locatelli, the street artist from Belgium, hopes that this will change in time, especially when visitors see the limited edition of his skulls at his SKL15 exhibition at 44309 Street//Art Gallery during September and October. However, it hasn’t been always like this. What is a skull? Well, that’s one of the few things that is left behind us after we die: a solid, hard evidence that we’ve lived and loved and worked and created on this planet, at one time or another. Yes, it symbolizes death, as no skull is alive, but a remaining of once-living human being – but, one must ask: what’s wrong with death? It may sound like a good old oxymoron, but death an inseparable part of life. “They give birth astride of a grave, the light gleams an instant, then it’s night once more”, says Samuel Beckett in his famous Waiting for Godot. During the early Renaissance, a skull was used as a reminder of inevitable death, standing on a desk along with the phrase “Memento Mori” – “Remember, you will die”. In ancient times, skull was seen as a symbol for a great change, as well as a symbol for protection, strength and overcoming a difficult period, rather than a symbol for danger or death. So, a skull was a very strong symbol throughout the human history, and today it mostly is a negative sign and omen. However, Steve Locatelli is here to try to change that. 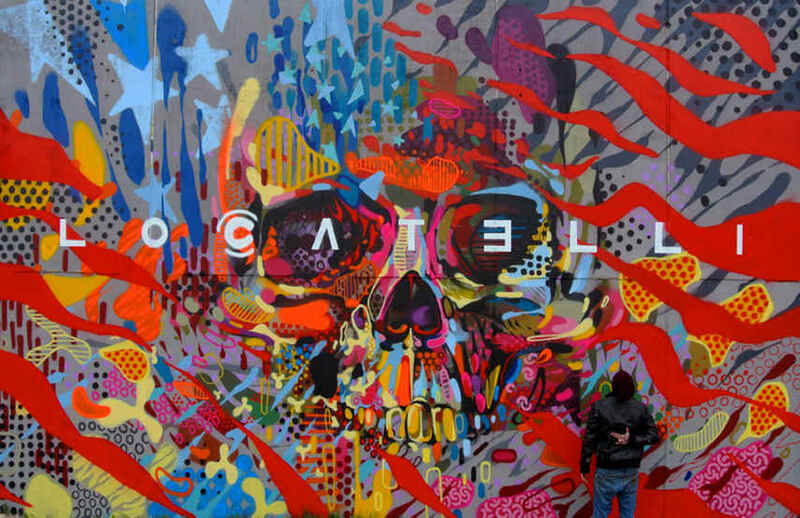 SKL 15 will be Steve Locatelli’s third exhibition in a row that is skull-inspired – the previous two were named SKL13 and SKL14. In his own words, Locatelli is very keen to detach the symbol of a skull from negative connotations that our modern time had given it. He is trying to remove that unpleasant and uncomfortable feeling that most of us have when we see a skull – and Locatelli says that he managed to do that with a lot of people, with his mother being one of them. 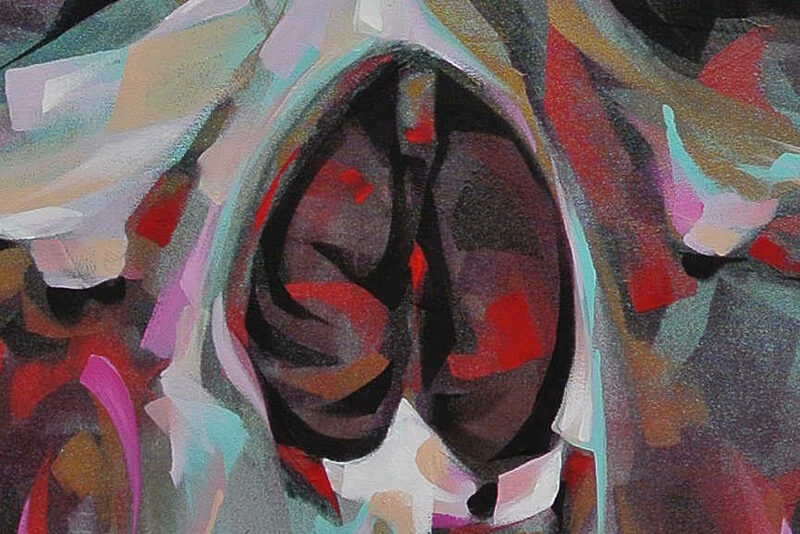 His skulls are painted in live, vibrant colors, and carry none of the usual adjectives that usually follow skulls – dark, gray, morbid… Locatelli’s skulls are full of life and positive energy, actually. 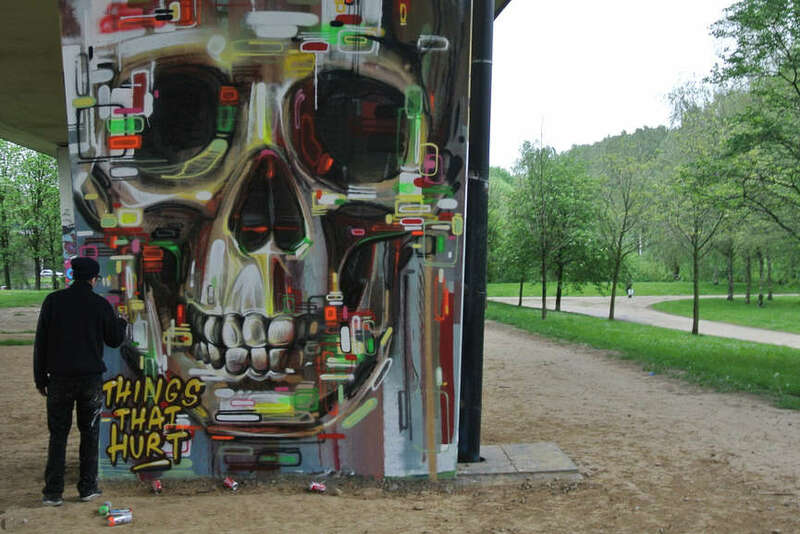 During his previous two tours across the Europe with SKL13 and SKL14, he has often experimented with shapes, colors and mediums while creating his skulls. 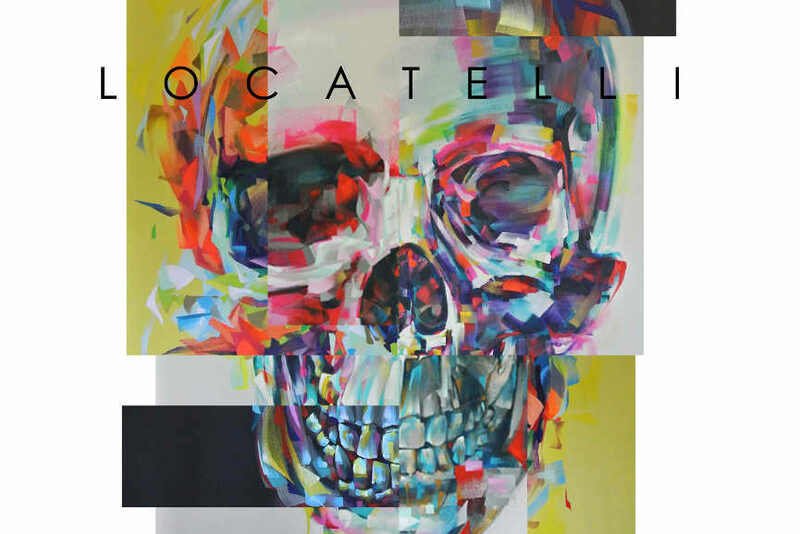 In one interview, Steve Locatelli explained that skulls are ultimately universal, as you don’t know the characteristics of the person it had belonged to – if it was a female, male, African or Chinese person – we are all the same under it all, says Locatelli. 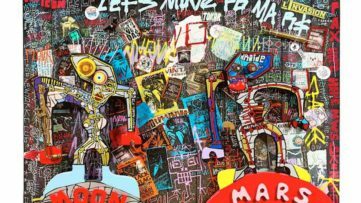 Steve Locatelli’s SKL15 exhibition will occur during the rest of September, and throughout October at 44309 STREET//ART GALLERY. 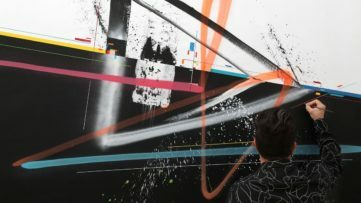 Locatelli is a 37 year old from Brussels, Belgium (born in 1978), and he is primarily a street artist – he started with his work back in the nineties, in the Brussels metro. 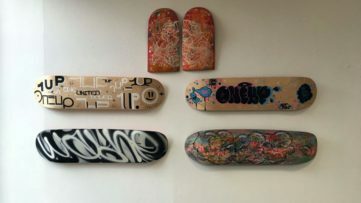 In 2007, he opened his Artifex shop in Antwerp, with the goal to help enthusiasts to purchase not only equipment, but also ideas and unique creations. 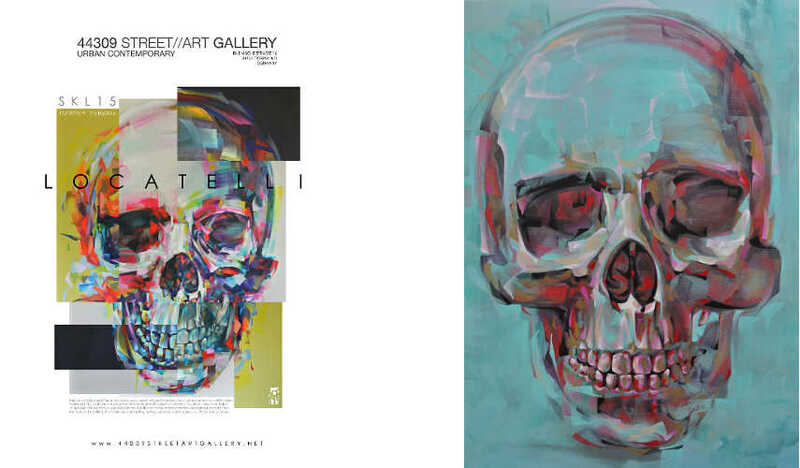 His third edition of skulls exhibition, SKL15 will start on September 12th, and it will last until October 31st.